Some of you might not know, but I have two children, ages 6 & 8. The funny thing about kids at this age is that they want to be just like their parents. I know that this doesn’t last very long, so I get to eat it up as long as I can. I try to instill good values in them so that they make wise choices when they grow up. This means that I have to lead by example. This is not an easy task for any adult. However, I think twice before I speak or act. They always ask me, “what did you do when you were my age?” or “did you do this, when you were little?” I guess it is their way of trying to figure out if they are on the right path. As a father, it is my duty to make sure that I am supportive yet serve as a guide to the righteousness. Telling my kids about how things used to be is important for their development. I think it is important to share our family’s history and give our kids a glimpse into the past so that they know why we do the things we do today. Every night I read to them a bedtime story. Sometimes it is the story about Ali Baba and the 7 thieves other times it is a story about Buddha, Jesus or Mohammed. But the one story that really resonates for them is the story of Riesling. My children are well versed in wine. My daughter made a video about nature and wine not too long ago. And when my son started to write, he wrote his 10 steps to drinking wine. So naturally, the Riesling bedtime story is one of our favorite times of the day. Remember what I said in the first paragraph, “I try to instill good values so that they make wise decisions when they grow up.” And although they are not of age to drink, at least I have started to plant the seed, so that they only drink the good stuff. I don’t want them to make the same mistakes I did, getting drunk from Coors and Mickey’s Big Mouth. I want them to have class and drink something they will enjoy and not get wasted. Parenting is difficult and I must commend myself for being forward thinking and watching out for the things most parents don’t think about or try to ignore. This leads to my explanation which is a bit far-fetched, but reasonable to a 8-year-old. I tell them that our government was busy putting an end to the cold war, and all the Riesling had to be used for this effort. They don’t understand the concept of the cold war. I had to give them a quick run down on World War II and how Germany was divided into two countries, one run by the Capitalists and the other by the Communist. The cold war was a war where the Capitalist raced against the Communist to have the bigger and better toys. 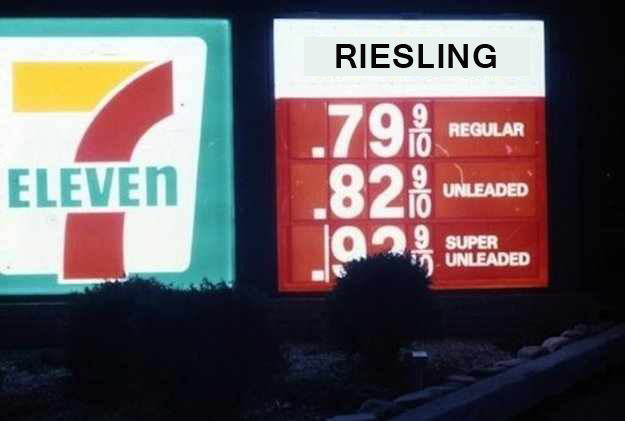 To put an end to the crazy competition, the Germans decided to give Riesling to both sides. Both the Capitalist and Communists agreed to unite the two countries and this soon brought tensions to a stand still. However, this led to using a lot of Riesling, thus not letting us use it for our cars. 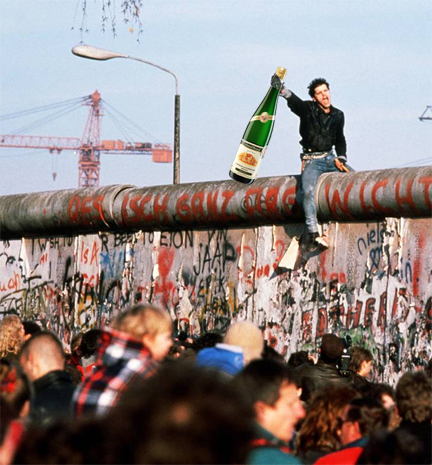 I explained how the Berlin wall finally came down because Riesling brought everyone together and helped mend their differences. My kids didn’t even bat an eye. 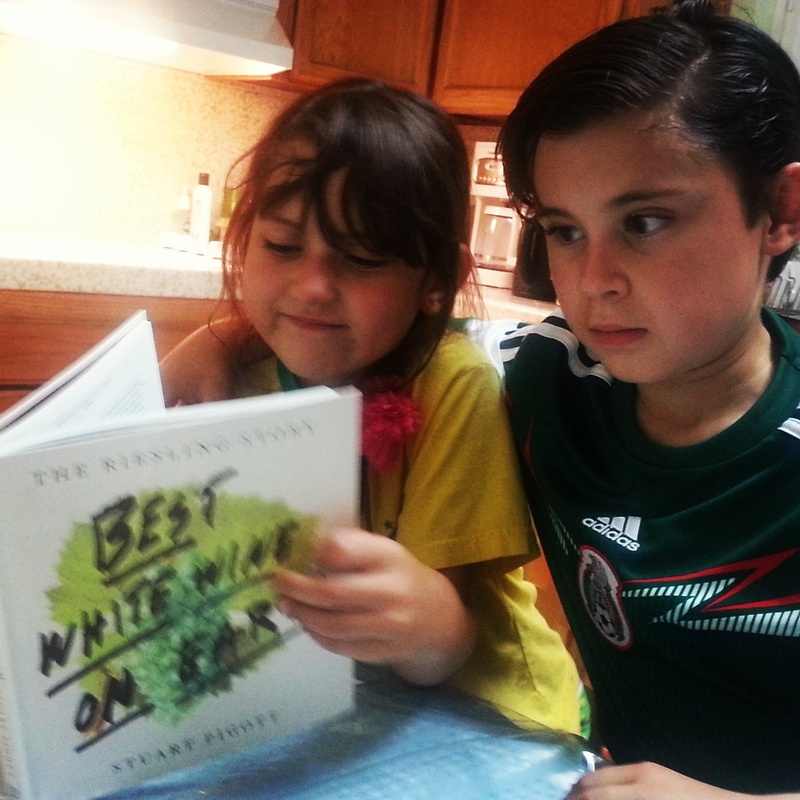 It is fascinating for them to learn about how things used to be when I was young. Like most kids, they love their toys. They think that I too played Minecraft on an Ipad. But I had to tell them that when I was little we had different toys. My toys were not electronic and required some sort of physical skills, like kicking and throwing a ball. The electronic toys we did have were Atari, hand-held head to head football and Pac-Man at the arcade. I tell them that those toys were very different from today’s electronic toys and that today the toys are a lot better. That being said, they miss out on some of my favorite toys such as Legos that are rectangular and Erector sets. But that as a boy, my favorite toy by far was the Riesling Ring Toss. 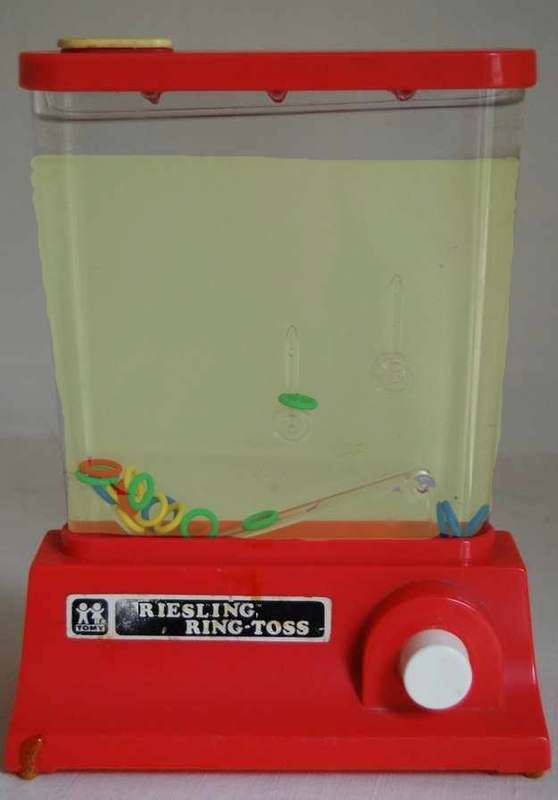 Most my friends had the plain ol’ water Ring Toss, but mine was the Riesling Ring Toss. It had more viscosity. Much more challenging. A few nights ago I overheard my kids talking about how they are going to ask Santa for the Riesling Ring Toss. Chips from the old block. It seems that at every meal it is a struggle to make something that they both could enjoy. One likes steak the other chicken. One likes rice the other french fries. At breakfast my son loves pancakes and my daughter likes cereal. I feel like I am always trying to convince them to try new foods. So of course they ask what I ate when I was their age. I would tell them that times were different. When we ate dinner my parents used frozen vegetables. (No wonder I didn’t like them). My parents would also make us eat cow tongue, yuck! We had to eat everything on our plate. The one meal I enjoyed most was breakfast. My favorite breakfast was Fruit Loops and Riesling. If you have never tried it, you should. 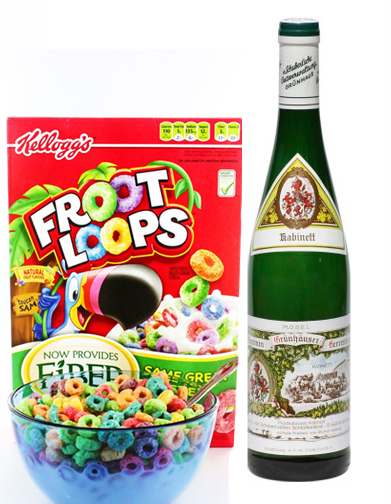 Pour Riesling into your Fruit Loops and see how quickly you wake up. Bright acidity and sweet fruit. I think this was the reason I was so interested in food and wine pairing. Fruit Loops and Riesling. So now when I am running late getting the kids ready for school, Fruit Loops and Riesling is a winner in my household. “What movies did you like when you were a kid?” asked my son. “I had so many favorites”, I replied, “Like Charlie and The Riesling Factory, The Wizard of Pflaz, Pretty in Straw Yellow, Finger Lakes Jones and the Raiders of the Lost Bottle and my all time favorite, Slate Wars: The Weingut Strikes Back.” This evening we decided to watch one of my childhood favorites, Honey, I Gave Riesling to the Kids. Super dad! It worked. The whole family loved it. Things were very different in my day. My role is to be the best parent I can be. I need to make sure that my children have a better childhood than my own. They also need to know how things used to be. I can only hope that my children carry with them strong values and live happy healthy lives. For this reason, I need to show them the righteous path of Riesling. I hope that this summer you have an amazing Summer of Riesling! I know we will! Once again Maurice you are very entertaining. Charlie and the Riesling Factory. Oh the tales they will tell LOL Thank you for the laughs. Be at c- level Aug. 3 to celebrateour wedding anniversary. Hope to see you there. I love dry Rieslings. They are like a party in my mouth.